I have to confess that I am not a great lover of ice-cream – I usually find it too sweet, but my opinion has recently been changed with the arrival of a new kid on the block. Gower ice-cream is the brainchild of Mark Sansum, of Watermark Financial Planning, who has been a regular supporter of the Bay’s walk pages, and Ryan Jones, ex Captain of Wales rugby team. Its range includes mint choc chip, strawberry, chocolate and vanilla, and my team of trusty tasters were hard pushed to select a favourite. Named after local Gower beaches, the ice-cream has an ethical side too in that all the packaging is biodegrade-able – including the ‘plastic’ spoons. The graphics are fab too. Langland Bay chocolate is intensely chocolatey but also manages to remain clean on the palate. The Three Cliffs vanilla is anything but plain – its natural vanilla flavour is perfect served alongside fresh raspberries and crushed meringue for an ice-cream sundae, while the addition of fresh strawberries to the Rhossili strawberry flavour takes it to another dimension – and surely it must be part of my 5 a day? Four tubs of ice-cream is too much for one to sample, so I had to recruit anyone who was passing through Bay Towers – fortunately it was a busy day so I wasn’t short of volunteers, one of which said that the Mumbles mint choc chip was tip-top and had to have the pot wrestled from their grip. Available from many outlets in and around Gower and Swansea – their distinctive packaging and promotional material is easily spotted – I highly recommend that you give it a try – did I just manage to get a rugby reference in? I’m not sure how true it is, but I have heard that if you get a pub called the King’s Head on one side of a road, you get a Britannia on the other side – just like the heads and tails of a coin. Maybe that’s where the Britannia in Llanmadoc gets its name – with the King’s Head over the hill at Llangennith – who knows. What I do know is that the Britannia is the perfect spot to sit on a sunny summer’s evening as it has a huge garden with stunning views over the Loughor estuary. We arrived on a hot early June evening, after a long day on the beach and managed to bag our-selves a table where we would get the very last of the sun’s rays. The specials menu seemed to feature lots of fresh fish – presumably locally caught – tonight mackerel was the catch of the day. No self respecting pub menu should be seen without beer battered fish and chips – here it was hake. A chunky piece of firm, white fish encased in a crunchy coating of crispy batter with of course proper chips – all the better for eating it sitting outside. Another special on this evening was confit leg of duck with mashed potato and vegetables. I am a sucker for duck confit – I do sometimes cook it at home, but the time and effort needed to produce this soft as butter, melt in the mouth meat is so lengthy and takes astronomical amounts of duck fat, that it really is only on high days and holidays. Here the duck was tender and juicy, and the mash was a perfect vehicle for its gravy – what could be better? Sometimes I judge a restaurant by its exterior – not always coming to the right conclusion. For months I have passed by Vietnam in Uplands and have been put off by the garish pink walls and flashing open/closed sign. Last month while looking for a place to have a quick supper I was persuaded to give it a try. The welcome from the waitress was warm and friendly and we were quickly seated at a table in the window – all the better to watch the world go by. The menu was similar to what I’d expect to find at a Chinese restaurant but having never been to either China or Vietnam I’m not qualified to comment. 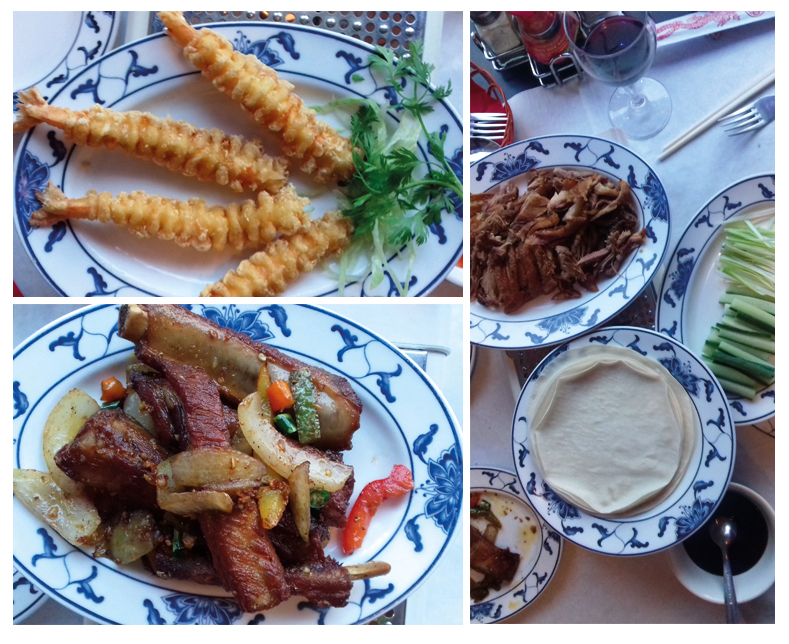 My favourite part of a meal is always the starters and here my choice was difficult as not only was there aromatic crispy duck with pancakes but also salt and chilli pork ribs and deep fried prawns – fortunately there were three of us and I was in charge of ordering. The duck was good with just the right amount of saltiness that was balanced by the hoisin sauce and there were plenty of pancakes to go round. The ribs were deeply savoury with a hint of chilli heat and the only thing wrong with the prawns was that there were four of them between three of us! Main courses of crispy noodles with chicken and black bean sauce plus pork with vermicelli noodles provided a good balance between soft and crunchy. All in all the experience was good and I would certainly return which just goes to prove that you shouldn’t judge a book by its cover.